"The Lineup: Drug Store Robberies"
The American drug store as we know it came into being around the time of the Civil War. This was when the scientific method became popular and many new drugs were discovered. The drug store, however, is much older than Civil War times. Roman physician, Galen, worked to classify drugs and their effects. His work had such a wide influence that several of Galen's drug compounds were still in use until the beginning of the 19th century. He had the first apothecary, keeping his drugs in wooden boxes in a storeroom (the Greek word for storeroom is apotheca). The first actual drug store, however, opened in Baghdad in A.D. 775. Not only were they first to open a drug store, Arabs were also the first to license their pharmacists. Times, however, were quite different. Pharmacists barely made a living at that time, and did undertaking to supplement their measly income. We jump ahead to the turn of the century - when patents were popular, and medicines were no exception. Although patented, most medicines were not so unique in formula - cocaine and alcohol were the main ingredients in many of them. Drug companies slowly took over one of the pharmacists' main jobs - mixing the medicine. 80% of medicines were still compounded by pharmacists in the 1920s. In the 1940s, 26% were compounded, and in 1971, the mortar and pestle was nearly defunct, with only 1% of dispensed medicines needing to be compounded by the pharmacist. 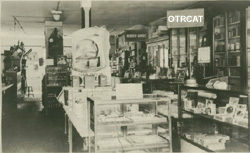 In the 1920s, drug stores began to incorporate lunch counters and soda fountains into their store plans. Hamburgers sizzled, and neon mortar and pestles flashed in the window. The drug store chain was invented, and had its big boom after WWII. 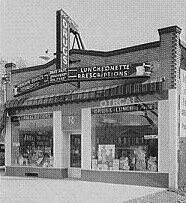 The 1950s were known as the golden age of the drug store, with Rexall Drugs ("Rx to all") taking the lead and setting up shop in what seemed like every town. This brings us up to date for many of the the radio shows in this collection. Crack yourself up with Archie Andrews, Jack Benny and others as they try to run the drug store with hilarious results. So, slip up on a stool, order yourself and chocolate malt, and shoot the shoot with Kremer (Fibber McGee and Molly's pharmacist) and Richard Q. Peavey of Peavey's Pharmacy (the Gildersleeve's druggist). Also included are some drug store mysteries with Green Hornet, Nick Carter , Perry Mason and Johnny Dollar. There is also a recently added Inner Sanctum episode included in the collection. See also: Fountain of Fun. If you pass a Canadian Rexall drug store and sing, "Good health to all from Rexall."